The most important place visited by Tutubi and friends in Angono really is the 3000 year old Angono Petroglyphs inside a sprawling playground of the rich and infamous-- the Fiesta Resort and Casino. 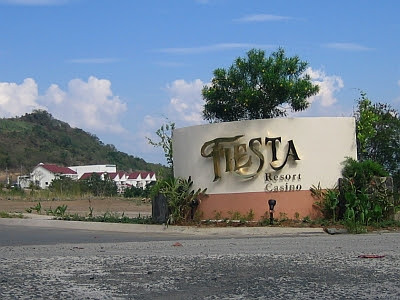 The Fiesta Resort and Casino, now Thuderbird Resorts, said to be owned by a former president and retired generals. The refugee truck will "deliver" its "cargo" there. Going there wasn't easy as there's no public transportation available. The gang literally looked like refugees inside a truck they boarded in front of Maricor Bakery used by employees of Thunderbird Resort (formerly Fiesta Resort and Casino). Alighting at the marker (picture above) and walked about a hundred meters to the guard station and registered there. 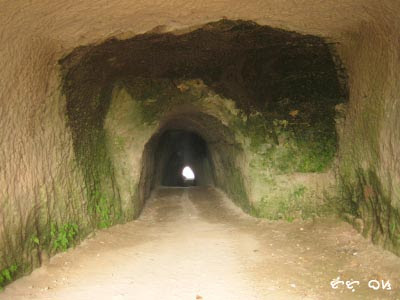 at the end of the tunnel is a marker that said Angono Petroglyphs in Binangonan, and a trail that points to a museum managed by the National Museum plus a viewdeck of the Petroglyphs. 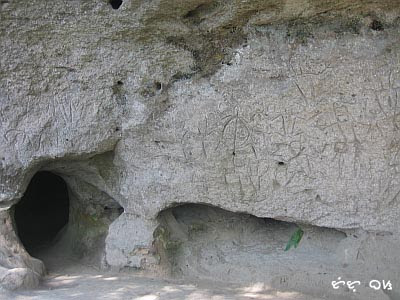 The pre-historic drawings, officially called Angono Petroglyphs in Binangonan due to its within the territory of Binangonan town, consists of 127 drawings of human, frogs, lizards and other animal figures inscribed on the rock wall estimated to date back to 3000 B.C. Signs of vandals on the loose. People that desecrate important cultural places like this should be hanged or crucified with the head down! 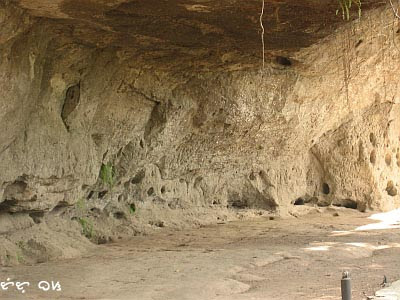 The Angono Petroglyphs is a National Cultural treasure that should be preserved for generations to come. Commute to Angono: Board the Angono-bound jeepney/vans at EDSA Central terminal on Shaw Blvd or alternatively the Angono-bound jeeps in Cubao, Quezon City. Alight at Angono market. Board a tricycle to take you to Maricor Bakery. At Maricor bakery, wait for the truck used by employees of Fiesta Resort and Casino (you need to pay a small amount for this). Ask the driver to drop you off at the junction of the road going to the Petroglyphs then walk about 100 meters to the guard station. Register at the guards and look for the man-made tunnel about 30, turn right on seeing a golf course. There is a building and small museum maintained by the National Museum. There's also a guard stationed at the site. No video allowed, only photographs. Driving directions to Angono, Rizal: take the Manila Road East (not the one leading to the town proper), turn left on the street where Maricor Bakery is (ask tricycle drivers since there were no street signs in that part of the world when we visited). That road leads straight to Fiesta Resort and Casino (now Thunderbird Resorts Rizal) where the Petroglyphs site is located. If you want to get to Angono, Rizal from abroad, book a flight to Manila then take a taxi to EDSA Crossing, board a jeepney/shuttle to Angono. Taxi Fare to EDSA Crossing is about P300.00 plus the approximately PhP30.00 shuttle fare to Angono. do i need to make prior arrangements to go there? or pwede punta na lang sa site? did they build a tunnel after the discovery or prior? who knew this existed. really nice trip. thanks for the walk through this interesting place. and these tunnels really exit, ha? they're amazing! This is very interesting. I will visit this place on my vacation. those petroglyphs are amazing. vandalism isn't. Very interesting indeed. I didn't realize that there were also cavemen in the Phils. Btw, I have been getting errors when I try to visit your site. This is my third try actually. I wonder why. This place looks really interesting; I gotta visit it when I am there again. I like those pre-historic drawings. ang ganda nga nung place. i was about to say na buti wala pa vandals, until i saw that one. Grabeh! Ang dami talagang puwedeng makita magagandang lugar dito sa Pinas! Thanks for sharing this, Tutubi! tutubi, what a coincidence! 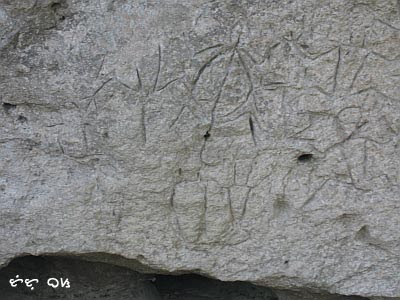 i just recently posted an article in my blog about petroglyphs that i took up and down the Rock Canyon river, which dates as far back as 9,500 years ago. i didn't know that we have it also in the philippines. i notice that they love to carve animals and human beings. interesting! Interesting! I wonder what could be the interpretation of those carvings? Have you tried simulating some chanting? I think the place has good acoustics to induce a trance. And the trance provided the visions for those carvings. Very interesting post. We have a lot of pre-historic drawings and carvings from thousands of year back in Norway too you know. rennyBA, norway's too different than philippines. will re-visit your blog soon. besides this place, are there possible other places in the country? I've been longing to go back to this place as the last time I went here was like in 1997 pa. I wonder how it looks like right now? estanli, good question. been searhing for other samples of ancient rock art, petroglyphs and petrographs here in the Philippines and one of them is in in Alab, Mountain Province carved on boulders on top of promontories. "The Petrographs are of two kinds: a) Charcoal drawings on cave walls in Penablanca, Cagayan Province, and the Singnapan Caves in southern Palawan; b) red hematite prints in Anda Peninsula, Bohol province. The dating of these is still undetermined." Very very interesting Tutubi! This one is for National Geographic. I never knew that these petroglyphs existed. Agree ako with Toe, pang National Geographics ito! With the guards around, I wonder why na-vandal pa rin? Maybe recently lang naglagay ny guard? What a pity! Amazing that something like this exist. It should be well guarded to deter vandalism. tin-tin, lots of undiscovered or non-marketed places here talaga. tutubi, thanx for the info. sana mapuntahan ko ito one of these days. or if you guys are going, sama nyo ako. Tutubi, thanks. I visited that place about 10 yrs ago. Pwede na rin sigurong idate yung vandals art na yun. 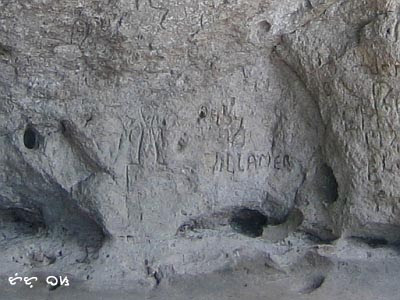 Dahil sa vandals work, nagulo na yung petroglyphs. At the time I visiterd, no guards really and exposed to the elements so it will be eroded. Tingnan mo values nung ex pres na sinasabi mo. Elected Pres and he never cared for it and mukha lang sugal at babae. The nerve na di man lamang ishowcase site.Pwe!! Tutubi, thanks for informing our fellow kababayans about this very important site. been there twice this year because i accompanied our students for an outbound education.corasoq, ur right.the place is subject to erosion. sayang talaga! my students and i donated some money there where the Nat. Museum employees are.Hope that others who'll go there will also do the same. Hope that our people in the government will really pay attention to this national treasure. Mahirap talaga siyang puntahan but worth the trip coz the fresh air is free. We are doing a study on valuation of the cultural heritage of the Cordilleras. I have been trying to browse the net for a picture of the Alab petroglyphs...non so far. If there is one,please furnish me one. We can compare with the recent photos that we have. It is really very sad how the interpretation of the rock carvings were misinterpreted. We are coming up with a documentation of the Alab petroglyphs. I hope you will be interested to support this endeavor for the Cordilleras. Wow. I bought my house in Binangonan 6 years ago and if im in Phils. i go to market in angono as it is closer. I couldn't believed what i have just read here. i thought there is nothing really interesting in Angono. i've heard about the casino though... Im going home this coming x'mas so for sure i will go there...Can't wait... thank you Tutubi for this info. for sure if i didnt read this, i will be old and know nothing about this very important place in Angono. Its always a pity when such places get vanalised obviously by people that don't understand their own heritage and the fact it needs preservation not destroying. Good photos by theway very clear to see the carvings in the rock. Thanks for the commuting without a car information. How much did you pay for the truck ride? We would be three men riding. I am sure that those petroglyphs will be claimed by China.